The Arktic is one of our most popular chalets and has received several press accolades as one of Tignes’ elite chalets. Its light and modern lounge is designed and furnished in a funky contemporary style, and the view from the huge floor-to-ceiling windows, out over the sun-terrace to the lake and the whole Tignes bowl, are simply sensational. The Arktic is home to a superb indoor pool and leisure facilities, including a sauna and outdoor hot tub, from where guests can enjoy more stunning views. We update Chalet Arktic's details often, but facilities do change. e.g. some extras listed by the supplier as "free" or included might only be for the first time you use them, or for one time per party, then charged for further use. If any specific feature is essential to your holiday, make sure you ask us to confirm the details of it before you book your holiday. This package holiday to Chalet Arktic in Tignes, France departs Sunday 15th December 2019, for a 7 night stay on a "catered chalet" board basis. A local tourist tax (Taxe de Sejour or Kurtaxe) is levied by many councils in European ski resorts. It varies by standard and type of accommodation and is age dependent, so not everyone is charged. It's not included in the basic price of your holiday and is usually paid locally. For reference, the average charged in winter 15/16 was between 50p and £2 per person, per night. Tignes lift pass price last reported as €294 (adult 6 day). Ask for a quote when booking Chalet Arktic. Chalet Marilyn Tignes France, Stansted to Chambéry 15th December. 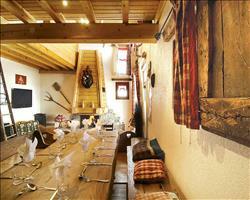 Chalet Les Arolles Tignes France, Stansted to Chambéry 15th December. "Great group trip to Chalet Arktic"
The Arktic was amazing! Much better than we all expected. The hosts who did the cooking and cleaning were incredible, if it wasn’t for them it wouldn’t have been as good a holiday. It would have been useful to know that the wellness facilities are only open at a certain time, from 5-6 onwards. I wasn’t skiing as I was pregnant and another girl injured herself and it would have been nice for us to enjoy the facilities while everyone else was skiing. When we could use it, the spa was perfect, can’t fault it. The social area was brilliant – the Arktic has a really big, very open plan living-kitchen-dining area which meant we could really get to know the hosts. We got on so well that we ended up asking them to join us for dinner on the last day, so they’d cook a course then pause to eat with us which was really nice. The food was much better than I’ve ever had in a 5* hotel, considering how young they were, they were really good at cooking and put us to shame! They started off with canapés half an hour before dinner, all handmade from scratch rather than just chucked in an oven and a different thing every day. Starters were soups followed by a different main every night: we had duck, beef, pork, fish (and they knew a few people didn’t like fish, so offered chicken as an alternative). Puddings were lovely and there was always more than enough wine for everyone – we never had to ask for more. For the guys who wanted to ski, the location was close enough that they could take a route that finished right behind the chalet, so they only had to walk about 15-25m back to the chalet. It was also a lot closer to the main area than I’d thought. The bedrooms were a bit of a nuisance for all of us. Most were perfect and everyone was happy but there was a double room that shared a bathroom with another bunk room that had no windows or ventilation. It was more of a ‘family room’ arrangement (though it wasn’t described as this) so wasn’t ideal for 2 couples. Also the chalet was really hot and while the rest of us could open our windows, the two in the bunk room couldn’t. In the end we all ended up chipping in 20 euros each for them to have a different room. We were a group of 18 and a lot who stayed with us usually do self-catered ski holidays. They reckoned that staying at the Arktic worked out a lot cheaper and said they’d stay here again. "Very good staff, food & facilities"
We had a very good week here, the chalet has nice facilities and the location wasn’t bad either in terms of skiing in and out (you’d have to be quite a good skier to make the most of it but we knew that before we booked). To get into town for the restaurants and shops was just a short walk. We enjoyed the food which wasn’t just local French food, but featured a bit of everything. Our chalet staff did a very good job. I had an excellent holiday at the chalet Arktic. I would rate the chalet a 4.8 out of 5! It was a beautiful chalet, although I would have loved to have a window in the bedroom with some views. The architect has put in small, long windows, which are high up in the bedrooms (which didn’t suit everybody) and the effect was great, especially when it snowed (you have to see it to fully understand). The chalet staff were fantastic and the food was excellent. I would say the location is good… Not great, but good. It was a little trek to get to the nearest lifts. "Better than it looks in the photos"
Really good chalet. The staff were brilliant. The food was good. The photos on the website don’t actually make it look as good as it is, we were expecting the bedrooms to be dead simple but they’re really nice. The only thing was from the bedding I actually got scabies, which surprised me as it seems to be a pretty clean place. My friend sleeping in a different bed didn’t get it, and other people in the chalet didn’t. There were problems with other people who’d been put in the small room. The official description of the room isn’t the greatest. It caused problems for us when we were there as someone had to sleep in the TV room so we couldn’t use it. Otherwise, it was awesome and the spa and everything else was lovely. Location is brilliant, it was a bit of a walk as we went to the main lift rather than the closest one, but it was fine. "The top chalet on "normal" budgets"
This is one of the nicest chalets that's bookable on the "realistic budget" of a regular skier or snowboarder. We love the incredible views and the hot tub caps it all off. The property gets good feedback for the levels of hosting. The quality of the food and wine and position within Tignes add up to a great package. I like to say to clients that it's worth noting the star ratings are approximations and do differ from supplier to supplier - I don't think for instance that this is in quite the same league as a five star from one of the "expensive" operators, but that's why it’s so much better value than those posher 5 star catered chalets, which are well over £2k per person for a week's holiday. Among the huge selection of "normal priced” ski holidays, this is one of the best catered chalets at the top end of the quality scale. If you've been on a few ski holidays and you fancy treating yourself this winter, without leaping to the prices of the really fancy boutique chalets (that are 3 or 4 times the price), this is a really nice option.